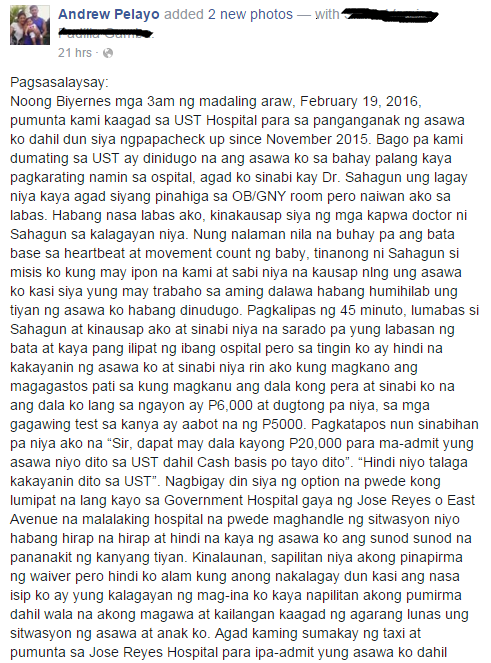 MANILA, Philippines - Andrew Pelayo and his wife lost their baby after a certain ob-gyne of the University of Sto. Tomas (UST) Hospital refused the latter’s admission while she was in labor on Friday, February 19. 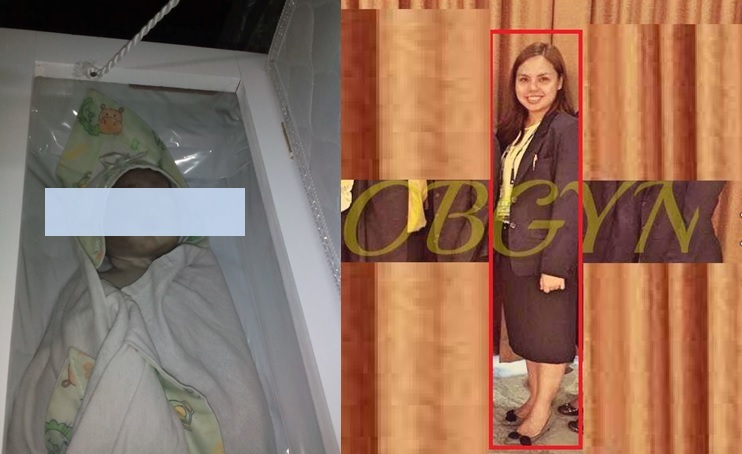 Andrew Pelayo blames Dr. Ana Liezel Sahagun for the tragic death of his baby. In a lengthy Facebook post, Pelayo revealed that he brought his wife, who was experiencing bleeding at that moment, to the said hospital at around 3:00 am since she has been undergoing check-ups there since November 2015. After the doctors verified that the baby inside the womb was still alive based on its heartbeat and movement count, a certain Dr. Ana Liezel Sahagun reportedly asked Pelayo’s wife if they have enough money to pay for the hospital bills. Pelayo’s wife requested the doctor to talk to Pelayo since he is the one who is employed. After 45 minutes, Dr. Sahagun allegedly approached Pelayo to inform him that his wife’s birth canal is still closed and that they have enough time to have his wife transferred to another hospital. Pelayo, who was only holding P6,000 at that time, was apparently told that they wouldn’t be able to pay for the hospital expenses since the tests they will conduct would already amount to P5,000. “Sir, dapat may dala kayong P20,000 para ma-admit yung asawa niyo dito sa UST dahil cash basis po tayo dito. 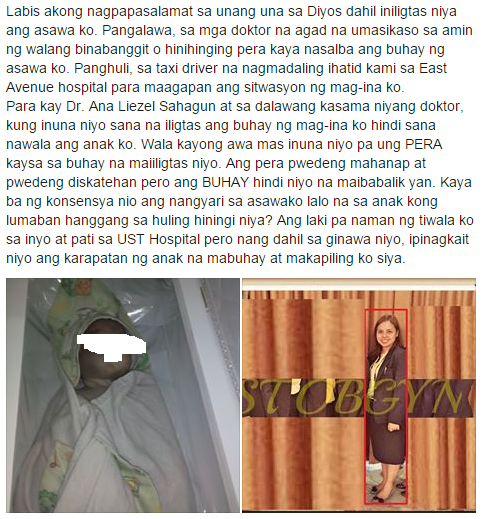 Hindi niyo talaga kakayanin dito sa UST,” Dr. Sahagun allegedly told Pelayo. After being forced to sign a waiver, which Pelayo unfortunately failed to read due to his wife’s situation, Pelayo was left without a choice but to bring his wife to Jose Reyes Hospital. Upon learning that the hospital did not have an incubator, Pelayo decided to bring his wife back to UST hospital. “Sir, bakit pa kayo bumalik dito? Di ba sinabi ko naman sa inyo hindi niyo kakayanin dito. 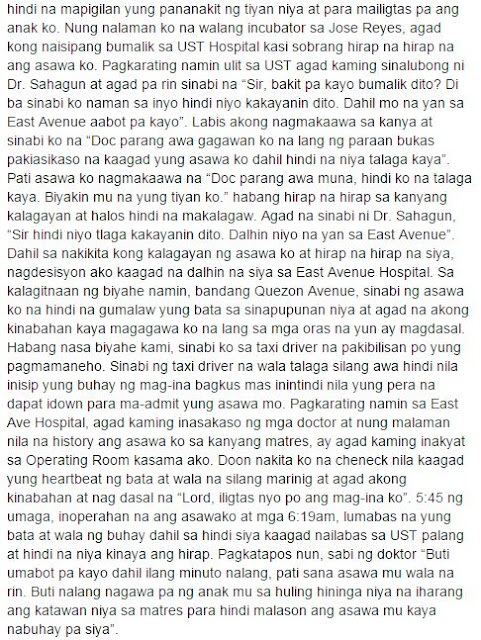 Dahil mo na yan sa East Avenue aabot pa kayo,” Dr. Sahagun told Velayo after seeing him return to the hospital. Despite his pleas, Dr. Sahagun apparently declined to admit Pelayo’s wife. This and his wife’s worsening condition prompted him to rush her to East Avenue Hospital. While they were on their way to the hospital, Pelayo’s wife told him that the baby wasn’t moving anymore. When the doctors checked the baby’s stats, they found that the baby doesn’t have a heartbeat at that point. Pelayo’s wife was immediately brought to the operating room where she underwent surgery. At around 6:19 am, Pelayo’s lifeless baby came out. Although Pelayo’s wife survived the ordeal, one of the doctor informed him that his wife barely made it alive. “Buti umabot pa kayo dahil ilang minuto nalang, pati sana asawa mu wala na rin.” the doctor told Pelayo. 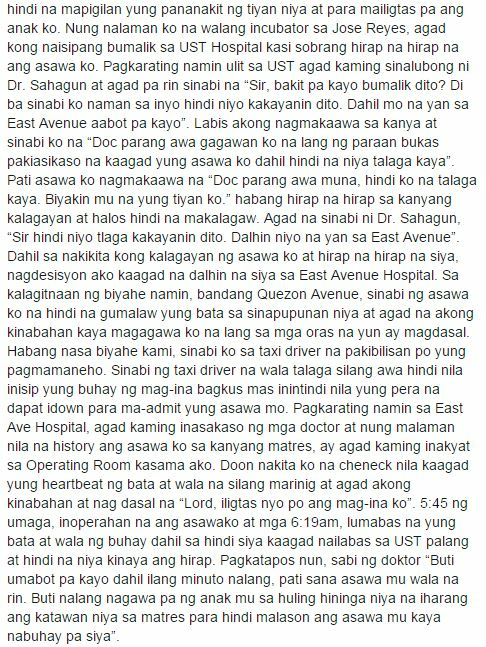 Dr. Sahagun and the management of UST hospital are yet to release an official statement about the issue as of press time. Check out Pelayo’s full Facebook post below.